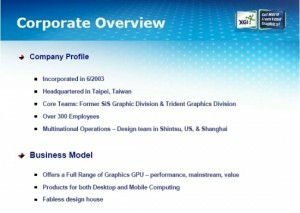 XGI’s current solution for the value market, the V3XT, boasted pretty advanced technical specifications, such as full DirectX 9 support, low power consumption, a fanless card design and YPbPr (HDTV) signal output format support, making it an excellent solution for multi-functional multimedia PCs and home entertainment systems. As you see, the Volari 8300 boasts interesting features although it belongs to the value/entry level solutions. Its major technical specifications, such as the frequency and number of pipelines correspond to those of the ATI Radeon X300. However, unlike the ATI product, the Volari 8300 boasts a number of additional attractive features, such as MET/MRT support , up to FP32 texture formats and even 8Kx8K texture size support! The Volari 8300 (XG47) will feature an engine clocked at 300MHz engine and a memory clock of 350MHz memory clock. It would be available in 256MB, as well as 128MB and 64MB versions. With its very low power consumption (7.5 watts maximum dissipation), the card will require no active cooling and will be completely fanless). There would also be versions with 32MB and 16MB of onboard memory available, with up to 128MB of graphics memory thanks to dynamic memory management (eXtreme Cache Technology) – we will come back on this point later. Products based on the XG47 architecture will employ a native PCI Express support. The main improvements of the PCI Express structure over AGP are the higher transfer rates (PCI Express transfer rates are 4 times higher than AGP) and bi-directional transfers. SmartTile is XGI’s memory interface architecture which improves bandwidth utilization by storing pixels in 4×4 rectangular tiles instead of traditional scan lines. Since these tiles can be cascaded to cover the entire display area, memory bandwidth efficiency up to 90% can be achieved. 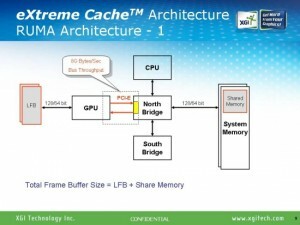 One of the new technologies introduced in the XG47 is the eXtreme Cache Technology. Its working principles are very similar to NVIDIA’s TurboCache, the main idea behind this technology is that the graphics adapter uses a combination of local memory on the graphics card and PCI-E bandwidth to render frames. The eXtreme Cache technology promises to bring a performance boost, but more importantly, it drastically lowers the price of a graphics card, as it can now be outfitted with less onboard graphics memory. 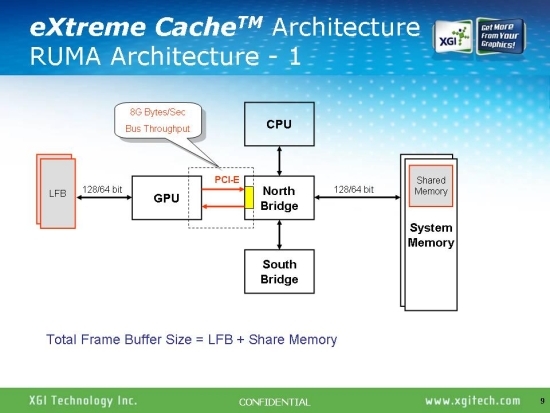 As mentioned the PCI-E bus is used to deliver the needed bandwidth, but in order for this to be really effective, you also need an efficient way to distribute the load between the local memory and the system memory accessed through PCI-E. To enable this, XGI uses the RUMA (eXtreme Cache) architecture which dynamically allocates memory from the system memory to maximize performance. Simply put, the onboard memory is used to cache data and to deliver peak performance when needed whereas all other data is allocated to main memory through the PCI-E bus. This will allow cards with 64MB, but also 32 MB and even 16MB models to be manufactured using up to 128MB of main memory. As shown above, the XG47 could also have no onboard graphics memory. However, this would also affect the graphics performance and therefore is not recommended by XGI. However, they have added this possibility as some clients may be interested in this option, such as notebook manufacturers since the XG47 will also be available for mobiles. According to the specifications, the chip features two pixel pipelines (2×2 configuration) each with 8 texel samples, 4 Pixel Shaders, 2 vertex units and 8 depth/stencil outputs. The XG47 graphics processor supports extended DirectX 9.0 specifications with features such as MET/MRT, up to FP32 texture formats, non power of 2 textures and 8Kx8K texture size support. One of the most noteworthy features of the XG47 architecture is MRT, multiple render target, which allows the graphics processor to apply the lighting in a scene after all of the geometry is rendered, thus effectively canceling extra rendering passes by avoiding valuable processing time to calculate the lighting for pixels which do not contribute to the visible portions of the rendered image. Another worthwhile new feature is that the XG47′s BrightPixel engine works with 32-bit precision throughout the pipeline thanks to its hardware 32 bit floating color buffer and support for 32 bit floating texture formats. This becomes especially important when we start using effects such as subsurface scattering, soft shadows and global illumination since developers can now apply more translucent effects. Last but not least, the increased texture size (up to 8Kx8K) allows developers to use even bigger and more realistic textures. While the current Volari series have often been praised for the good 2D image quality, XGI has strived to improve the display image quality. The XG47 uses an ultra sharp 420 Mhz RAMDAC pumping out high quality analog output signals to ensure flicker-free displays and legible text at ultra-high resolutions and at the highest color depths (i.e. 2048 x 1536 @32bpp). As far as I know, the XG47′s RAMDAC speed is higher than any other competing product out there, ensuring a superb output with a high-quality image. Of course, the card supports multi-monitor configurations too. It also incorporates XGI’s UltraClear technology in order to provide an ultra sharp image quality on LCD displays. UltraClear helps eliminate typical “ghosting” effects in watching DVD on a LCD screen and produces a clearer and sharper image. The hardware video processor built into the XG47 should definitely appeal to home cinema fans, with its hardware de-interlacing and built-in Motion Compensation and IDCT. The advanced Shader Model 2.0 support will also come in handy to enhance video playback with the help of special pixel shaders through DirectShow’s Video Mixing Renderer9 (VMR9). Last but not least, the card’s low power design allows the card to be completely silent (fan-less solution). According to XGI representatives, a low profile version is also in the works. Due to this broad functionality in terms of video playback and processing, the XG47 definitely turns out to be an excellent solution for home entertainment systems using Windows Media Center Edition operating system. 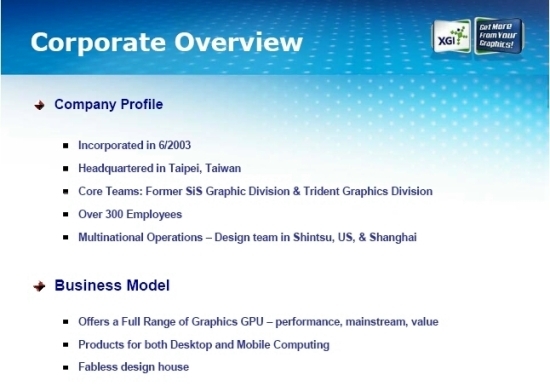 CoolPower is XGI’s unique power management technology originating from their partnership with top OEM notebook customers and significantly reduces both active and standby power consumption. CoolPower employs a combination of software and hardware techniques which permit the end-user to select either highest performance or longest battery life while running their applications of interest. According to the above discussed technical data we can draw a pretty simple conclusion. The Volari 8300 (XG47) looks like an appealing alternative to the Radeon X300 in terms of features and performance, according to XGI. It seems the card’s pricing would be lower than the X300 too. The card definitely looks tailor-made for a multimedia or home theater use with unique features such as HDTV 1080i/720p output formats set this card apart from the others in its price range. The processor runs cool enough to only need passive cooling, and the silence is ideal for an HTPC situation where the faintest hum of fans may interfere with video or music playback. It’s in the mobile market that the XG47 would prove even more interesting, with its low power consumption (7.5 watts maximum dissipation) and the eXtreme Cache technology, making it ideal for thin notebooks. Right now we feel confident to say that this is a very interesting chip with a number of truly unique features, making it a very good choice for your needs.